Schedule a reading. Relax and recharge. Okay, I admit it. I like to pull as many cards as possible for any given tarot reading. What? They’re pretty! The version of the Celtic cross that I currently use includes 14 cards (rather than the usual ten). And I’ve thought of adding more. And perhaps my brain is being colonized by the Lenormand, because I also keep adding connections between the cards. I also like to ramble on and on and my tendency to add more, more, more cards just enables that. Yes, I enable my own bad habits. [hangs head] But, again, have you noticed how pretty the cards are? 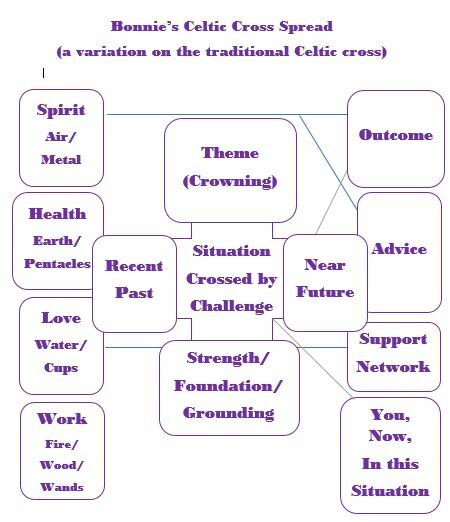 I’m sharing my Celtic cross here, because 1) I never have before and 2) people tend to get confused with my ramblings. If you are a client who has a photo sitting around that I sent you, and you have my interpretation, and you’re STILL confused–perhaps this will help. Or not. Maybe I’m just adding more words to the many that are already floating around your head! The first ten cards are pretty typical for the Celtic cross, though I’ve given them different names in some cases. The last four are the ones I added. They each relate to an element; plus, I like the symmetry of having four cards on each side. You’ll notice that I’ve added lines as well–that’s to show that there are certain cards that I tend to especially read in connection with each other. For example, your support network (some readers read this as your environment) seems to me closely connected to the people you love, so I’ve drawn a line between them to indicate that. The connection between spirit, outcome, and advice may be less obvious, though. I almost always save these three cards for last and read them together at the end of the reading. I didn’t INTEND to make a connection, but there almost always is one. Maybe always. So the cards wove that part on their own. But think about it. What’s going on with you at a spiritual level SHOULD have a lot to do with the advice you’re asking for that comes, basically, from Spirit. (It’s also, interestingly, often something you don’t appreciate as advice–the very thing you know you need to do but that you don’t want to.) And your spirit and your advice should also have an effect on your outcome. Is the outcome based on you taking the advice? I don’t know. I would say that the outcome is based on what is mostly likely to happen given how things look right now–and how things look includes whether or not you take the advice that is given. But that can get to be a very confusing line of inquiry, because when you look at something, you change it. And that applies to situations, too. So when you look at your situation, or ask me to, we change it simply by the act of looking. So the question of will you or won’t you take the advice may change after the cards have been laid down, in the course of our discussion of those cards. You may change your mind. I’m not entirely happy with my four elements lined up on the left, and here’s why: my brain simultaneously thinks in terms of the four tarot suits and also in terms of the five elements of the Nine Star Ki: water, wood, fire, earth, and metal. It’s like I look at four and see five, and look at five and see four. They flicker back and forth. So there’s a part of me that thinks, maybe I should be laying five cards here instead of four. Because more. And because, pretty! And on a practical level–consider the question of money. Money goes with water, because it flows, but it also goes with work, because work brings in money, and it also goes with earth, because pentacles/material/physical world. And for most people, at least some money at some point may also come from relationships (child support, or a spouse, or parents, etc.). Everything affects everything, and that’s the problem. And that’s why I ramble. Sorry! But I will probably continue to do so. I’ll try to be clearer in the future, though. You don’t have to make a phone call to schedule a reading with me. Just use my online scheduler at Acuity! It will email you a reminder, and will also let you reschedule if needed. The Spiritual Path: Why Tarot and Not Ministry? Does it matter if you "believe" in tarot? Remember Your Past Life as a Rock?